Sean M. Maloney is executive vice president of Intel Corporation, redefined the term ultraportables to call them ultrabooks. In a keynote during the ongoing Computex 2011 in Taipei, Sean says the ultrabook should include systems that are under 0.8” thick and costs less than $1000. Although the screen size was not defined, for the thickness alone, many of today’s 12” form factors will be excluded. The definition will include systems like Asus UX21 or the Macbook Air, among others. The main reason Intel could be drawing attention to this form factor is the Ivy Bridge platform that Intel says are built on 22nm architecture, making them far thinner than the present 32nm chips. 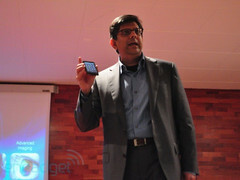 Intel envisions a rush of “ultrabooks” towards the end of 2012. As part of its continuous striving to get into the smartphone platform market, Intel showed of the Medfield platform during Computex. This 32nm platform will be the first Intel product to support Android out-of-box, and in fact was demonstrated running Honeycomb. Intel promises that Medfield can give the user an iPad-class experience with Android, and can make the system less than 9mm thick and lighter than 1.5pounds (0.68kg)in weight. But the first Medfield device could be a smartphone – as Intel's Senior Vice President Anand Chandrasekher spoke during the Mobile World Congress. Medfield is expected to shine in the battery life in particular. During the Mobile World Congress, the company promises the longest usage time with this platform.